The holiday horse stands on a glass bank. The ground is asphalt. There is a gold pine tree to the left of the bank. There is a silver pine tree to the right of the bank. There is a clear blue wall behind the horse. There is a large holiday man in front of the bank. To the right of the man there is a table. There is a large red bucket on top of the table. There is a tiny billboard on top of the bucket. To the left of the man there is a very large bell. The bell is 4 foot off the ground. The bell is leaning left. 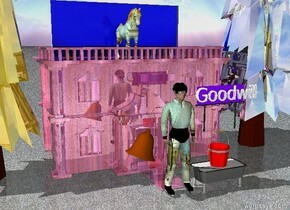 "Goodwill" is in front of the billboard. "Goodwill" is 10 feet off the ground. the yellow brick road is on the grass ground. the red dragon is on the road. it is upside down. the road is 80 feet long. 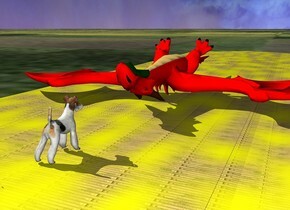 the white dog is a few feet in front of the dragon. it is facing the dragon.